GE Industrial PowerMark and Gold Plus™ Standard main breaker loadcenter is an enclosure specifically designed to house the 42 THQL branch circuit breakers and wiring required to distribute power to individual circuits. It is rated at 120/240-Volt AC and 225-Amps. The 1-Phase 3-Wire loadcenter has interrupt current rating of 22-Kilo-Amps. Factory installed loadcenter contains copper busbar and has a dimension of 14-Inch x 3-3/4-Inch x 43-7/16-Inch. Flush/surface/plug-on mountable loadcenter with combination cover, allows user to feed 1-AWG - 300-KCMIL copper and 2/0-AWG - 300-KCMIL aluminum conductor through bottom or top. 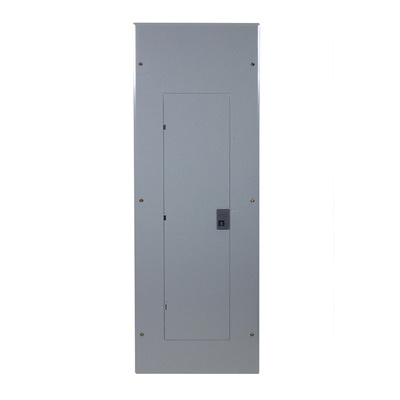 The NEMA 1 indoor rated enclosure provides split neutral connection. It has temperature rating of 60 to 75 deg C. Loadcenter is UL listed.